China's moon rover Yutu ("Jade Rabbit") rolls down a ramp on the Chang'e 3 lander after touching down on the moon's Bay of Rainbows on Dec. 14, 2013. A sharp-eyed NASA spacecraft is keeping tabs on China's recently arrived lunar lander, all in the name of science. NASA's Lunar Reconnaissance Orbiter, or LRO, has added China's Chang'e 3 lander and associated rover — which touched down on the moon on Saturday (Dec. 14) — to its list of observation targets. "LROC can image the surface to identify changes caused by Chang’e 3’s descent engine, similar to what has been observed from previous lunar landers," they added. "The resulting atmospheric and surface changes will provide LRO with a new scientific opportunity to observe the transport of gases on the moon and the effects of local disturbances on the lunar regolith." Three other NASA moon probes also were slated to observe the Dec. 14 landing for scientific purposes. The agency's Lunar Atmosphere and Dust Environment Explorer (LADEE), for example, kept an eye out for changes to the wispy lunar atmosphere caused by Chang'e 3's touchdown, officials said. And the two spacecraft making up NASA's ARTEMIS mission (short for Acceleration, Reconnection, Turbulence and Electrodynamics of Moon's Interaction with the Sun) did their part as well. "The first ARTEMIS spacecraft (P1) will pass within 124 miles (200 km) of the lunar surface on December 14," NASA officials wrote in the Dec. 13 statement. "According to current plans, the spacecraft will look for any plume signatures in the plasma or magnetic field associated with Chang'e 3's landing. The second spacecraft (P2) will observe pristine solar wind plasma and magnetic field conditions. This information is needed to determine how dust is lofted from the lunar surface." 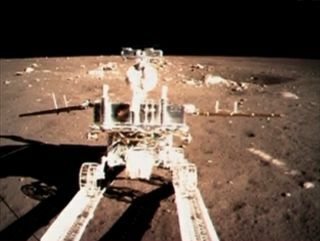 The Chang'e 3 success marked China's first-ever landing on the moon, and the first soft touchdown on the lunar surface since the former Soviet Union's Luna 24 mission in 1976. NASA's last soft lunar landing came in 1972, on the Apollo 17 mission. The Chang'e 3 mission carries a lander and a rover called Yutu, whose name means "Jade Rabbit." (Yutu is a pet of the goddess Chang'e and travels with her to the moon in Chinese legends.) Both robots will conduct science observations on the lunar surface. The $504 million LRO spacecraft launched in June 2009. It's about the size of a Mini Cooper car and carries seven different science instruments, which it uses to observe the moonfrom an altitude of 31 miles (50 km).